The Red Sox sent the New York Yankees to the showers with a Salty aftertaste in their mouths last night in the opening game of the final regular-season home stand at Fenway Park. Jarrod Saltalamacchia hit a grand slam to boost the Sox to an 8-4 win over the Yankees and notch their major league-leading 90th victory of the season, cutting New York’s elimination number for the American League East Division title to four games in the process. Meanwhile, out in Minnesota, the Tampa Bay Rays shut out the Twins 3-0 to stay within 8.5 games of first-place Boston in the AL East while seeing their own elimination number in the division get sliced to seven. The Red Sox kept up the recent pace in returning to home after a 5-2 road trip in which they batted .282 with 13 homers and scored an average of seven runs a game, but also took advantage of a shaky Hiroki Kuroda, who threw 51 pitches in the first two frames alone. Kuroda took the loss and fell to 11-11 after giving up five runs on eight hits and walking two in six innings. Preston Claiborne was tagged for another pair of runs and two hits in an inning of relief. While Boston made a valiant effort to provide starter John Lackey with the run support he’s so desperately been, well, lacking this season, the Sox surge came too late for him to get the win. He ended up with a no-decision after giving up four runs on seven hits while striking out three in six and a third. Brandon Workman got the win after only working a third of an inning in relief and moved to 6-3 for the Sox this season, while Koji Uehara was impeccable as always, retiring the Yankees in 1-2-3 fashion in the ninth to drop his ERA to 1.06 on the year. 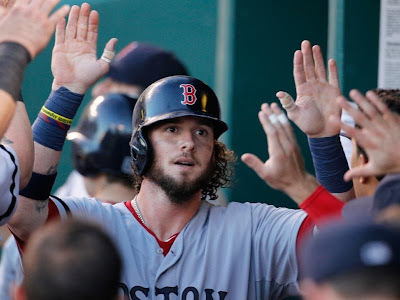 Salty took center stage for the Sox, going 2 for 3 with four RBI and a walk, while Dustin Pedroia, David Ortiz, Daniel Nava and Stephen Drew also recorded two hits apiece as the Sox out-hit New York 11-8. The Sox improved to 48-25 at home, tops in the American League and second-best in all of baseball behind only the Atlanta Braves, who are 51-21 at Turner Field. It’s the fourth win in five games for Boston versus the Yankees this week alone, and gives the Red Sox an 11-6 advantage in the season series with New York. 1) Nava Say Never Again: In the first inning, Daniel Nava — hitting .333 with three doubles and four RBI in September — singled to left to cash in David Ortiz from third to give the Red Sox a 2-0 lead. 2) The Drew Fits: Still in the first, Stephen Drew strode to the plate two batters later and ripped a double off the wall in left to reel in both Nava and Saltalamacchia for a 4-0 Red Sox lead. 3) Yanking Our Chain: In the seventh with the Red Sox holding onto a 4-2 lead, Robinson Cano hit a bases-loaded gapper to right field to double in Brendan Ryan and Chris Stewart and tie up the game. 4) Salt Lick: In the seventh the Red Sox loaded the bases with none out and Jarrod Saltalamacchia toppled New York when he took a four-seam fastball from reliever Preston Claiborne for a ride deep to right for Boston’s eighth grand slam of the season and fourth in the last nine games, lifting the Sox to the 8-4 advantage. It’s the most grand slams the Sox have hit as a team since 2005, when they posted 11. Tomorrow, Jon Lester (13-8, 3.86 ERA) takes to the hill to try and lead the Red Sox to their eighth-straight series win and MLB-leading 32nd of the season with a victory in Game Two. He is slated to face fellow lefty CC Sabathia, who is 13-12 with a 4.82 ERA for New York this season. First pitch is set for 1:05 p.m. EST.